I remember growing up, I had the hardest time drinking water. I just didn’t like it. I would drink anything else but water. Then those water flavor packets came out that you shake into water bottles. Those really helped me start drinking more water. That’s all I wanted, just a little bit of flavor. Since then I’ve finally learned to like drinking water (but I’m still a bit picky). For example I’m a total snob about having filtered water and also has to be cold with ice. However I still - from time to time - will infuse my water with flavoring or even just plain lemons. While lemon is great, I really wanted to switch it up. That is why I’m so excited to have my new Pressa Bottle that lets me infuse my own water with whatever I want. 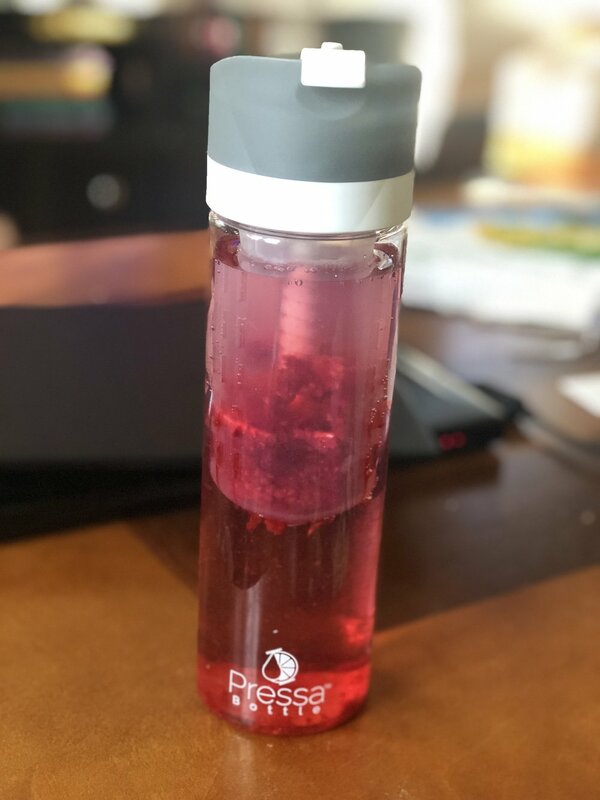 Now while there are a ton of other methods to infuse water, they are nothing like what the Pressa Bottle does. This is because the other infusers only submerge the fruit into the water and that is barely doing anything. If anything, the fruit ends up absorbing water. 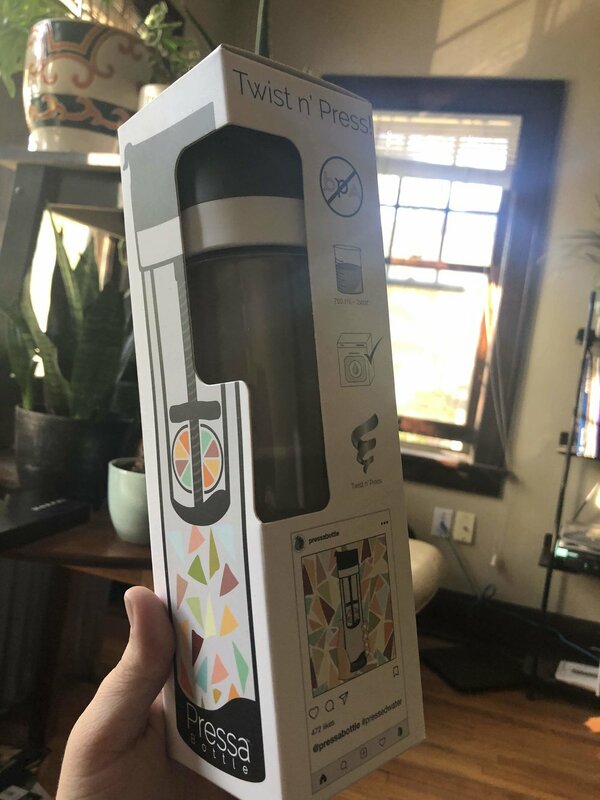 The Pressa Bottle does exactly what it says it does; it presses. The top part of the bottle has a dial that you can turn. 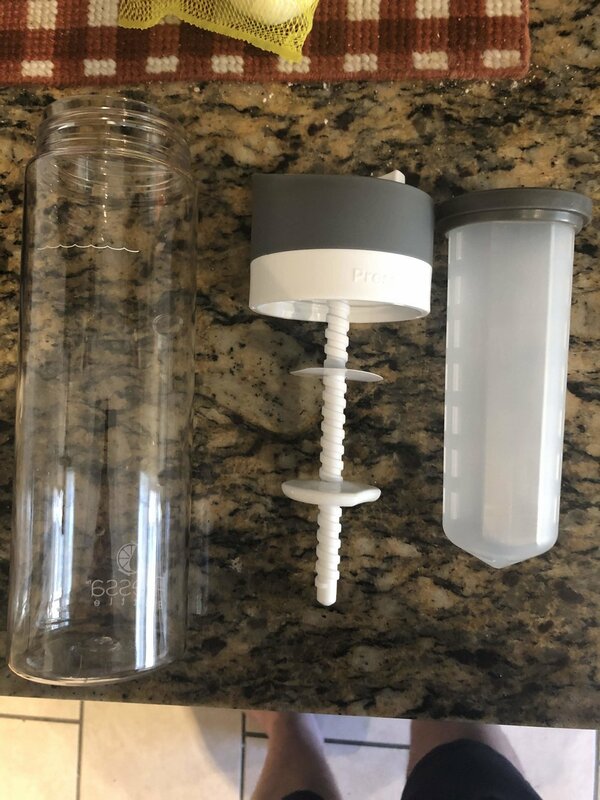 As you turn, the chamber inside the water bottle has a flat piece that screws down and presses the fruit down, letting its juice flow directly into your water. To be honest, this is such a simple idea and concept that I’m surprised it took this long. It’s such a simple idea. Press down on the fruit and BAM, the juices go directly into the water. I love it so much. The next thing I love about it is something some may not like. Depending on the fruit, some of it may slip through the chamber into the water bottle. For example the first one I tried was with raspberries. While those are typically a lot smaller, chunks of the berry floated to the bottom. I didn't mind though cause it sort of reminded me of pulpy juice! The design is very simple as well. It comes in three pieces; the chamber, the flat press that is attached to the lid and the 24 oz. bottle that is also made with BPA Free Tritan plastic. Or you can even get it in a glass bottle. They easily all come out which is always the scare I have when I buy products that come in more than two pieces. However because of this they are also a lot easier to clean by hand, however it also is dishwasher safe. 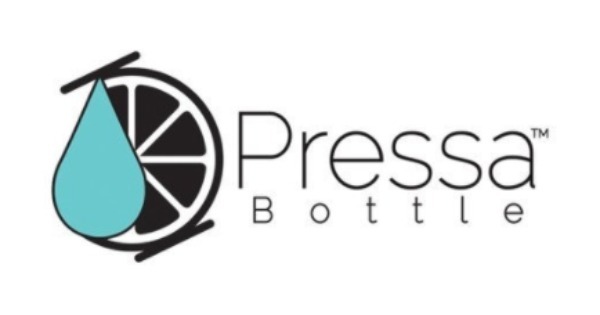 You can order your very own plastic or glass Pressa Bottle when you order online. When you order, don’t forget to use BRETTBURGER for 10% off any bottle. You can click the DealSpotr button below to go to their page on DealSpotr button below to go to their page and locate the most updated list of deals for Pressa Bottle. Don’t forget to use my code BRETTBURGER. Pressa Bottle sponsored this post. Although I received free product, all opinions are my own.